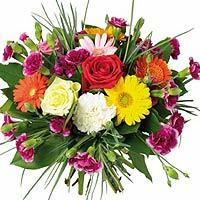 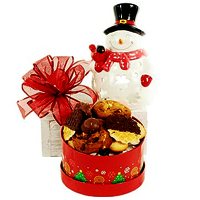 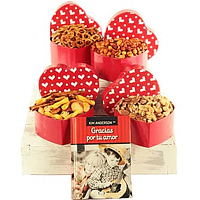 Product description: Order for your closest people Mesmerizing Celebration Cheer Gourmet Gift Hamper to appreciate them for being there with you always. 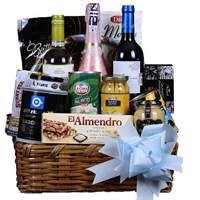 This beautiful Hamper is stuffed with 1 Chilean White wine, 1 French Red wine, 1Spanish Sparkling rosé wine, 1 Melba toast 200 grs, 1 Imported olives can 658 grs , 1 Grounded coofee Punta del cielo” 300 grs, 1Imported chewing gum 250 grs, 1 palm hearts can 400grs, 1 Baby corn 200 grs, 1 Maille Mustard 275 grs, 1 Imported Crabmeat Brunswick” 170 grs, 1 Almond turron with sea salt El Almendro” 75 grs, 1 Imported squid 115 grs and1 Smoked oysters 85 grs. 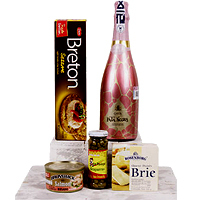 A perfect mix of flavors together in this basket ideal for share with the most beloved.Content:1 Pata Negra Brut Cava Rosé wine 750 ml. 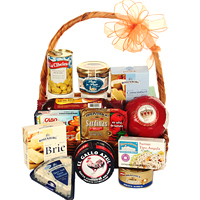 1 Imported salmon 270grs.1 Danish cheese Brie,1 Breton crackers 227grs.1 Capers 100grs.